The FDA stopped short of banning vaping flavors, and the agency declined for now to bar sales of menthol, mint, and other flavored tobacco cigarettes. Anti-smoking advocates renewed their criticisms of the FDA actions on vaping, e-cigarettes, and flavored liquids and tobacco products as too little too late to address the latest assault on the health of the young by getting them addicted to harmful nicotine and cancer-causing smoking. They got further reason for thinking the worst about industry deceit as researchers, digging into archives, published a new study showing how Big Tobacco, partnering with Big Sugar, hyped sugary drinks for kids in the 1960s and 1970s. They used their expertise in artificial flavor, coloring and marketing to heighten the products’ appeal to children. That tobacco companies once sold sugar-sweetened drinks like Tang, Capri Sun and Kool-Aid is not exactly news. But researchers combing through a vast archive of cigarette company documents at the University of California, San Francisco stumbled on something revealing: Internal correspondence showed how tobacco executives, barred from targeting children for cigarette sales, focused their marketing prowess on young people to sell sugary beverages in ways that had not been done before. Big Tobacco hyped Big Sugar products by shifting marketing and advertising dollars away from sales to adults, especially thrifty moms, and instead targeting children with big-spending campaigns. 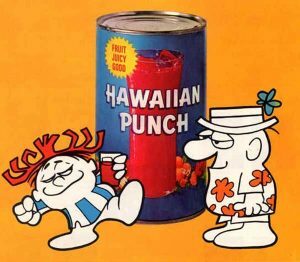 These employed colorful cartoon characters —think “Punchy,” the straw-hatted Hawaiian Punch pitchman or the animated Kool-Aid jug — and they thumped another Big Tobacco innovation: multiple flavorings. They included promotions featuring toy tie-ins and giveaways of tchotchkes or swag. The industry onslaught got further boosts when advances in packaging let companies sell easy-to-handle juice boxes with straws and marketers tied Tang to the hugely popular U.S. space program. Tang later was “repositioned” as a drink for tweeners, youngsters too old to want Kool-Aid or fruit juices but still needing a flavorful beverage of their own. Big Tobacco raked in its profits but eventually exited the beverage business. The damage, however, was done. In my practice, I see the harms that patients suffer while seeking medical services, and the wreckage that can be inflicted on them and their loved ones by smoking, bad diet, and excess weight. It’s unacceptable that so many youngsters struggle with obesity, diabetes, and other health challenges that are worsened by over consumption of sugary drinks. It’s unacceptable that the FDA has dithered in safeguarding young people from vaping and e-cigarettes, while also dawdling on protecting the general public, minorities especially, from the dangers of flavored cigarettes. E-cigarette advocates keep promoting the notion that the devices are less harmful than their tobacco burning cousins. They say the devices offer a way to reduce tobacco cigarettes’ damages. The research doesn’t exactly affirm this, but more studies need to be done. Meantime, the argument for vaping and e-cigarettes seems to be that old reliable, Trust us. Really, with what we know about how Big Tobacco pumped our kids (and us) full of harmful sugar? We’re supposed to be good with Big Sugar after it gamed research studies to downplay its product’s role in heart disease? No thanks, we’ve seen with sugary drinks how eager Big Tobacco can be to hook kids’ into unhealthy addictions, if nothing to get an early jump on ensuring a long and profitable consumer pipeline. Dr. Sharpless has gotten good press, so far, as he moves into this new role at the FDA. But he needs to be sharper and more vigilant about the nation’s health than was his predecessor, especially in fighting off the siren songs of serpentine lobbyists and smacking down Big Tobacco. That can’t be a wrong move based on all we know already.